ARGUS-class Mjolnir is a MJOLNIR armor variant designed by the Office of Naval Intelligence's Watershed Division. In October 2552 a Mark VI version of the armor was available. When the Spartan-IIs received their Mark VI Mjolnir armor in October 2552, Linda-058 was outfitted with the Argus variant. Linda's Mark VI Argus armor in the Halo 2: Anniversary terminals. The GEN2 Argus-class armor is the most advanced human-centric information fusion system ever placed in a mobile platform. It has a sophisticated battlenet control node that provides situation and threat awareness in all environments. Argus-class Mjolnir also has highly advanced cyberlink connections and cyberintrusion software that helps it collect information. The GEN2 variant was being developed by the Watershed Division. As of 2558, Linda-058 wears the GEN2 Argus suit. Helmet Description: ARGUS helmets feature the most advanced human-centric information fusion systems ever placed in a mobile combat platform. Combines passive cyberintrusion software with novel sensor cueing and filtering. Body Description: The ARGUS suit's sophisticated battlenet control node provides situational and threat awareness in all environments, as well as hardware-accelerated cyberlink connections for intelligence collection networks. The ARGUS-class MJOLNIR is named after Argus Panoptes, an all-seeing giant with one hundred eyes. This could also compliment the helmet's design, as it appears to have multiple types of optical equipment attached to it. The Arestor skin is named after Argus' father. All Argus armors in Halo 5: Guardians have "058" stenciled on the chest plate in Braille. In the final version of Halo 5: Guardians, Linda's GEN2 Argus armor has the techsuit gloves in two colors (beige and orange), in the same two-tone coloring scheme as Kelly-087's Hermes (light silver and yellow) and Fred-104's Centurion armors (pale blue and turquoise). Linda-058's Argus armor in Halo: Escalation. Linda's GEN2 Argus armor in The Hunt Begins. Linda using her Argus armor's thrusters to help her lift debris off John-117 on Meridian. Linda wearing GEN2 Argus on Reach in Halo: The Fall of Reach - The Animated Series. High-poly renders of textured and untextured armor for Halo 5: Guardians. Linda in her GEN2 Argus-class armor on the Argent Moon in a Halo 5: Guardians pre-release screenshot. 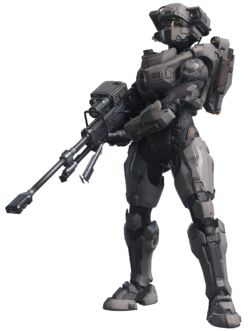 Linda in her GEN2 Argus-class armor in the final version of Halo 5: Guardians. Note the orange coloring on the techsuit gloves. The HUD of the Argus armor in Halo 5: Guardians. Linda-058 in Argus-class Mjolnir on the cover of Halo: Lone Wolf.